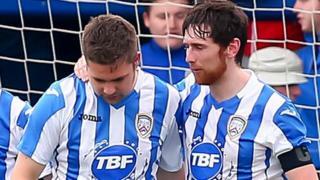 A late goal from debutant James McLaughlin earns Coleraine a 1-0 win over Glentoran at the Showgrounds. Glens keeper Elliott Morris made a string of excellent saves but his mistake let in substitute McLaughlin to poke home. Bannsiders manager Oran Kearney and Glens counterpart Eddie Patterson gave their thoughts on the season opener.